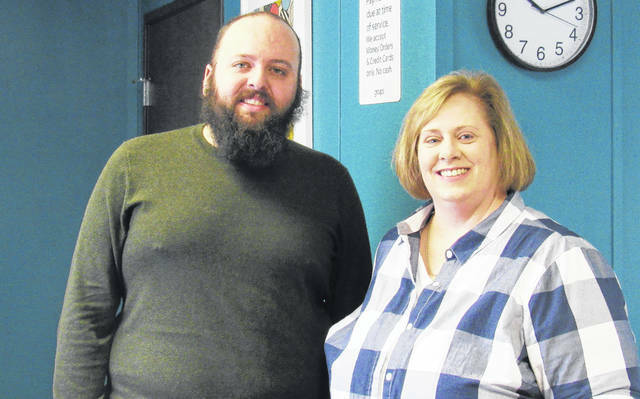 Groups Substance Abuse Counselor Anthony Galyon, left, and office coordinator Lisa Tilton staff the Greenfield Groups treatment location on Seventh Street. As the opioid crisis has become more pervasive, more and more treatment options are becoming available locally. In January, Groups opened its doors in Greenfield, just a couple months after opening a clinic in Hillsboro. There are also locations in Chillicothe, Georgetown and Wilmington. Groups deals only with those struggling with opioid abuse, and does so primarily with weekly group meetings and Suboxone therapy. And Groups serves those in typically more rural, underserved communities that lack the resources of more populated areas. According to information provided by Groups, the organization was founded in 2014 in New Hampshire by doctors “who wanted to meet the opioid epidemic head on by bringing affordable and convenient treatment to rural areas.” Groups is now in five states and has nearly 30 offices. Clients of Groups, known as members, gather weekly in group meetings. Prior to each meeting, members provide a urine sample that is screened for a number of illicit substances, but also to detect the presence of Suboxone, said Lisa Tilton, Groups office coordinator in Greenfield. When a member’s urine screen is clear of illicit substances and shows they are taking their prescribed medications, they are provided a new, seven-day prescription to refill their Suboxone. Medication is not dispensed on site or kept on site. But medication therapy comes with controversy. “You’re just trading one drug for another,” is what counselor Anthony Galyon has heard many times regarding the use of Suboxone, he said. “That is a statement of defeat” to an addict who is already likely feeling isolated and ashamed, he said. “Often, it’s as simple as recognizing that someone has taken a step in the right direction,” even if that step is medication therapy. “Sometimes the smallest steps lead to the biggest changes,” Galyon said. Galyon said the medication is a temporary tool to help an addict who is struggling, and seeing it as a tool is key. The medication “is not the end game,” but something that has its place in the treatment process to help those battling addiction to get on the right path and stay on the right path, to a place where they can maintain and manage their lives without the medicinal support. The Suboxone can only be taken for 18 to 24 months, but the support is ongoing. According to Tilton, support is available 24/7, and members who have graduated from the program are always welcome to attend group meetings free of charge anytime they need the support. The medication therapy, combined with the group meetings and the support is what Tilton calls “the trifecta.” She said that education tends to change the minds of those with “mixed emotions” regarding medication therapy to help treat addiction. Tilton has lived in Highland County for nearly two decades, and Galyon has lived in the area for about 10 years. “This is our home,” Tilton said. “It’s at the heart of how we each feel” about what Groups is about. “I have seen ground zero,” Tilton said, adding that she and her husband, as therapeutic foster parents, have fostered 34 children, all with varying needs. And she has a medical background and a history of working with at-risk children. Galyon said he grew up around addiction, and as he got older he steered clear of anything to do with it until he realized that a person must face challenges head on. That, he said, is where he began his journey to becoming a substance abuse counselor. “No one is untouched” by this epidemic, he said. And it will take the community to fight it. He leads the weekly meetings in Greenfield, and part of those meetings is journaling, something each member does before the start of the meeting and on a particular topic. It is a process that Galyon said helps promote proactive thinking rather than the reactive thinking of someone struggling with addiction. And it is a record of progress for that person, too. “Nobody wakes up and says, ‘I want to be someone who struggles with addiction,’” Tilton said. But the addiction crisis has happened nonetheless, and the opioid epidemic has a vast reach. She said a person would be hard-pressed to find anyone who doesn’t at least know someone who is battling addiction. And the fallout is vast, too, with children living apart from their parents, grandparents raising grandkids, the foster system overloaded, and so on. “We need to break the cycle,” she said. Those at Groups are confident in their treatment approach, and if a person needs more help, or a different kind of help, they will put them in touch with the appropriate resources. Members are also referred as needed to other types of resources like food, shelter, GED programs, and employment. Another aspect of the Groups way is its working with law enforcement, local agencies, the courts and communities to help provide the resources to those that need them. “Our priority is getting people what they need,” Galyon said, through Groups “holistic” approach. “We are here as a support to the community,” Galyon said, adding that even just one person’s success in the program is the community’s success. According to Tilton, Groups will become a familiar face at upcoming community events, and she is hopeful to host an open house at the Greenfield location next month where the public can come and see for themselves what the organization is all about. Currently the Greenfield Groups location at 226 S. Seventh St. is open Monday and Thursday 9 a.m. to 7 p.m., but as more people seek help, those hours will expand, Tilton said. https://www.timesgazette.com/wp-content/uploads/sites/33/2018/04/web1_groups-pic.jpgGroups Substance Abuse Counselor Anthony Galyon, left, and office coordinator Lisa Tilton staff the Greenfield Groups treatment location on Seventh Street.